Take on the dealer with real money Blackjack from PokerStars Casino, available in a range of different variants, including Single Player and Multi-Player. There are games to suit every budget, and you can even play for free. Check out the list of available variants below and start winning big with Blackjack at PokerStars Casino. For more on how to play Blackjack, head over to the Blackjack Rules page. 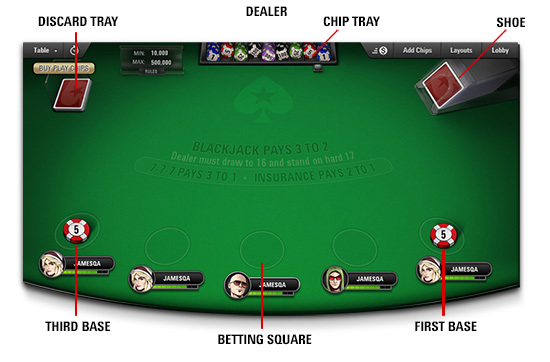 The evolution of Blackjack has seen the game take many forms. With different Blackjack variations from America and Europe dominating the many variants we now know today. The main difference between each variant is the number of decks used in the game. Other smaller differences include betting types and allowances on splits dealer limitations. Played with six 52-card decks where the dealer receives a hole card and must hit on Soft 17 (a hand featuring an ace that totals either seven or 17). Similar to Classic Blackjack, European Blackjack allows players to ‘Surrender’ their hand, receiving half their original wager back, if the dealer is showing an ace. Played using eight 52-card decks, the dealer will receive one hole card and must check for Blackjack if they have an ace or ten-value card. The dealer must stand on a Soft 17. Played using two 52-card decks, the dealer will receive one hole card and must check if the hole card is an ace or ten-value card and must stand on a Soft 17. Double down on a two-card hand if you’re committed to stand. 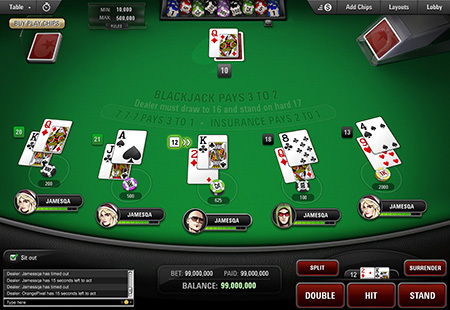 Premium Blackjack is played with four 52-card decks where the dealer doesn’t receive a hole card and must stand on a Soft 17. Played with four 52-card decks, the dealer receives a hole card and must automatically check for Blackjack if their open card is an ace or ten-value card. Dealers must stand on Soft 17. Played using two 52-card decks, the dealer will receive one hole card and must check if the hole card is an ace or ten-value card, and must stand on a Soft 17. Not sure which game is your favorite? Try them for free at the PokerStars Casino play-money tables! You can also play Blackjack (including Multi-Player) and Roulette games on your iOS or Android device, using the PokerStars Casino Mobile app. If you have any questions about Blackjack games at PokerStars Casino, contact support@pokerstarsnj.com. In Blackjack all card values are as you would understand them in general. Cards 2-10 are of value two to ten. Jack, queen and king are of value ten, and ace is valued at one or eleven. Hard Hand – any two card total that does not include an ace. A hard hand is defined as such because the total of both cards includes the risk of a bust. So whereas technically a two and three (equalling five) is a hard hand by definition, during the game it is soft because there is no risk of a bust regardless of what card you hit on next. Soft Hand – any two card total involving an ace. A soft hand means there is no risk regardless of what card you hit on next. The highest soft hand is a nine and an ace (equalling 10 or 20). Blackjack probability is a topic that has been discussed in online gaming arguably since its inception. The probability of a specific outcome is dependable on so many variants which make Blackjack so popular. It’s the unpredictable nature of the game that draws in millions and millions of fans to casinos and online casinos every day. Determining the odds of any outcome or hand of a game of Blackjack is not something that the majority of people can calculate mentally during a game. There are simpler calculations that you can logically make, for instance, the probability of your first card being an ace is 4/52, with your second card being value ten 16/51, however if you were to complicate the equation, the probability of you getting Blackjack with an ace first would be (4/52)*(16/51) = 64/2652 = 0.024 = 1 in 41.6. Blackjack odds and probability equations run into the millions. The more decks you play with, the more complex the probabilities become. Take a closer look at the game of Blackjack and the History of Blackjack throughout the years. From the pioneers of the game to the strategic nuances, it’s all here. The earliest version of the game of Blackjack containing the following elements: deck of cards, player vs. dealer, winner determined by numerical value of cards, was a Spanish game called Trente-un (31). Miguel de Cervantes, best known for Don Quixote, wrote about it in the book Rinconete and Cortadillo, published as one of his twelve Exemplary Novels in 1613. A gambling game named Trente-un appears in written works as old as 1440 (though there are several unrelated games by this name). A variation of this game was called Bone Ace in England during the 17th century. In Cervantes' story and in Bone Ace as described by Charles Cotton in The Complete Gamester (1674), an ace can count as one or eleven. A French predecessor of Blackjack called Quinze (15) first appeared in the 16th century and was popular in casinos of France into the 19th century. An Italian card game called Settee Mezzo (7 & 1/2) was played beginning in the 17th century. 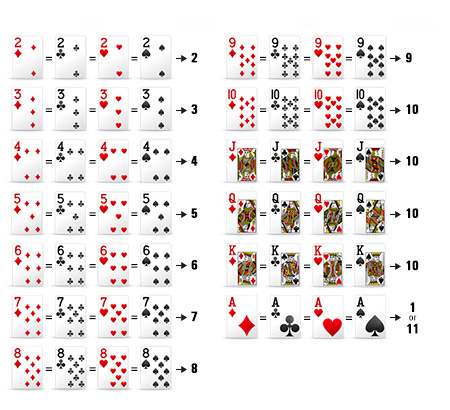 Sette Mezzo featured a 40-card deck (removing eights, nines, and tens). The remaining cards corresponded with their numerical value; face cards counted as one half. The rules of modern Blackjack came together in the French game Vingt-un (or Vingt-et-un ‘21’) in the middle of the 18th century. Enthusiasts promoting the game in France in the late 1700s and early 1800s included Madame Du Barry and Napoleon Bonaparte. Following the popular academic research by Dr. Thorp and subsequent players and analysts, Blackjack became the most popular table game in casinos. Although casinos benefited from the development of basic strategy, they have generally discouraged the practice. Although numerous court decisions have established that counting cards is not a form of cheating, casinos in most jurisdictions have the right to bar players for any reason. Individual casinos also modify Blackjack rules (sometimes differing from table to table): different numbers of decks, different deck penetration, house hitting vs. standing on soft 17, limits on splitting and doubling, and offering or not offering surrender.